Well I can't believe we have come to the final week of the End Game Quilt Sew Along. 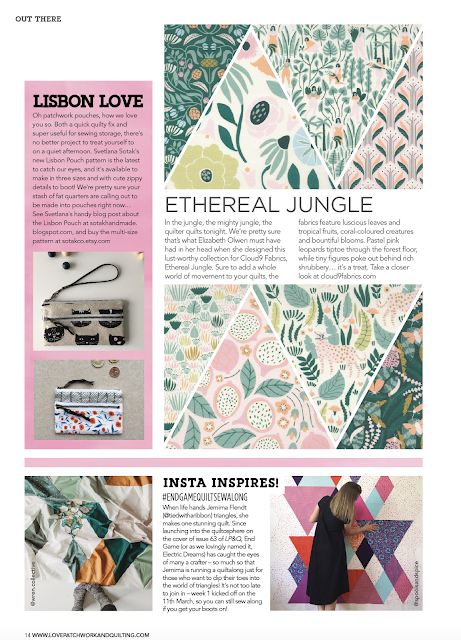 I am beyond humbled by all those who have joined in and for all the love this pattern of mine has been shown. 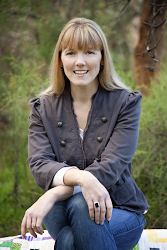 A massive thank you to you all for your support - it really does mean so much to me. So this week is all abut getting your End Game Quilt Top ready for Quilting, and Binding and being able to then finish it up. I have put together some tips and links below which I hope will help you with the decisions for this next part of the process with how you will finish it. 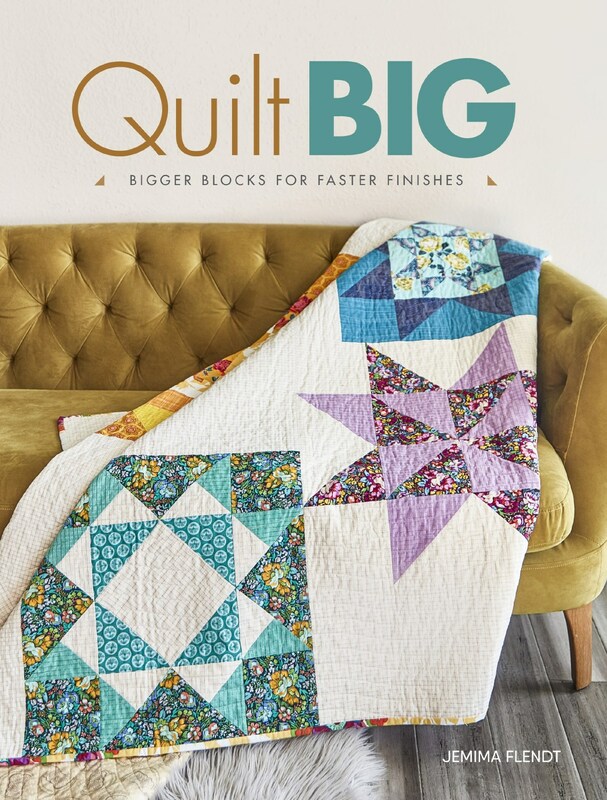 Did you see in the Latest issue of Love Patchwork and Quilting that the End Game Quilt Sew Along got a mention. So cool right! 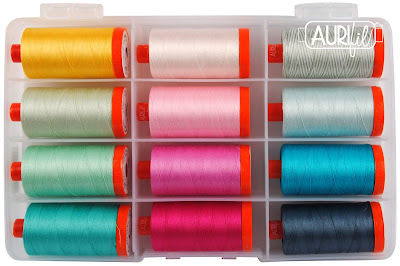 I was asked to put together a list of Aurifil Threads that Match the Tula Pink Solids I have used in my End Game Quilt. So here is my list of Aurifil Colours to match the Tula Pink Solids. Top left through to bottom right.. 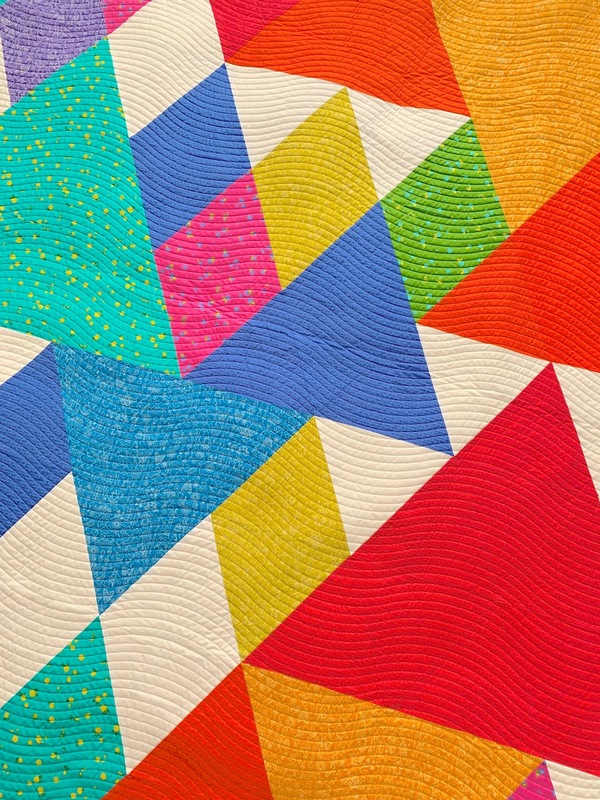 When it comes to deciding on how to Quilt your Quilt - you have lots of options. 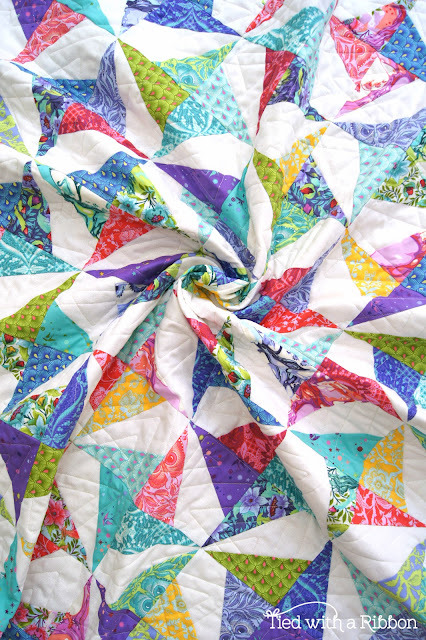 1 - Quilt It Yourself - for those keen to quilt your own Quilt there are lots of ways you can tackle this. I have Quilted all of the End Game Mini Quilts I have made. 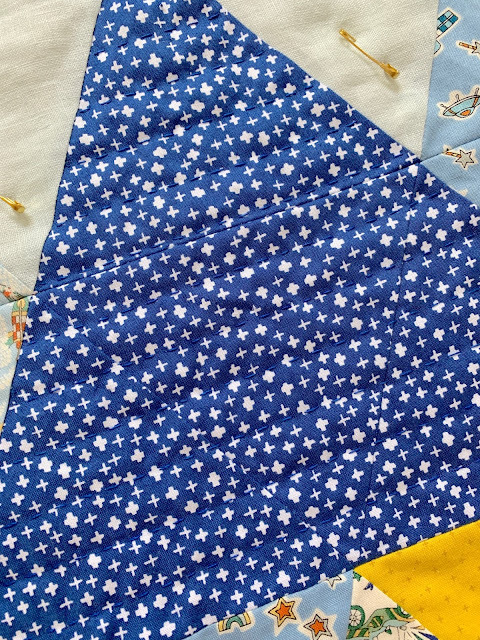 They don't have extravagant quilting on them - just simple lines following the diagonal of the triangles, using the seam line and my 1/4in foot on my machine as my guide. 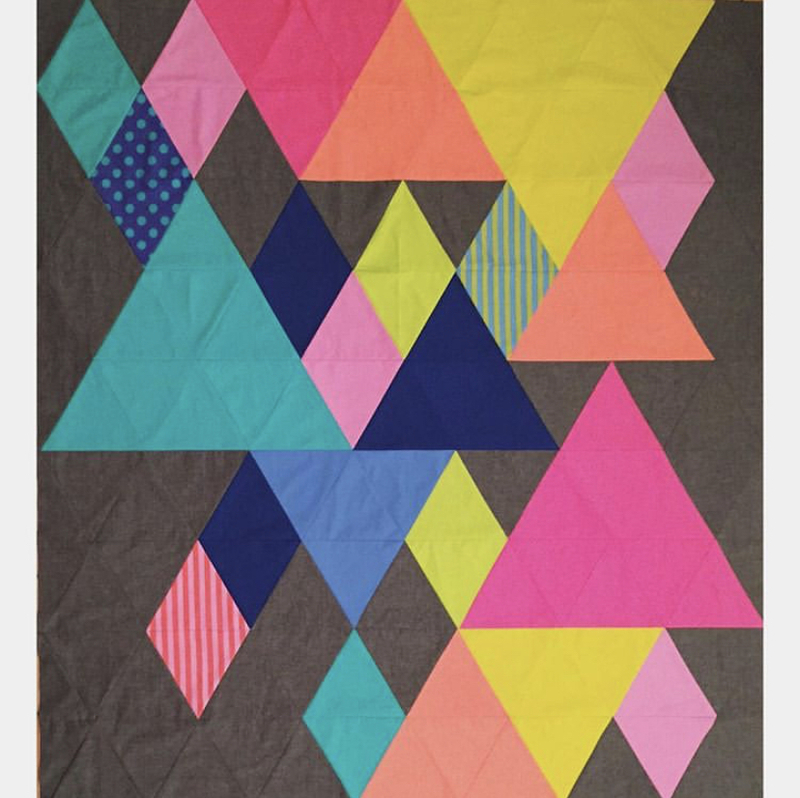 If you are quilting the Full Size End Game Quilt you will need to fill in your quilt with a lot more Quilting because of the size of the Triangles. 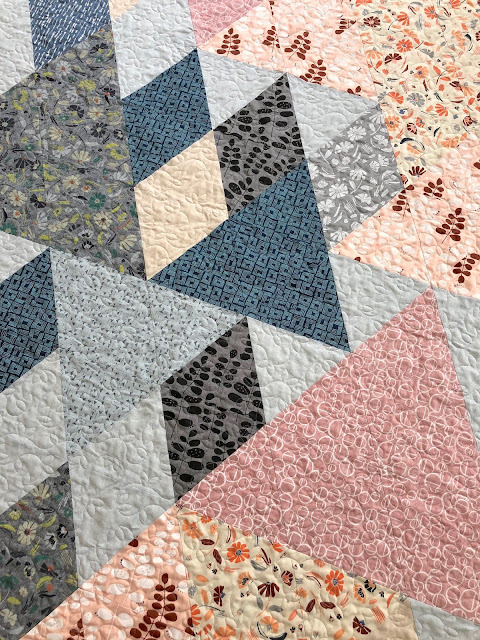 You can do this in lots of different ways - Straight Line Quilting, Cross-Hatching over the entire quilt, using a Large Zig Zag stitch without needing a lot of experience. For those wanting to give Free-Motion Quilting a go or already are familiar with this Technique, check out this Blog Post I wrote all about Machine Quilting. I hope this gives you some helpful tips. 2. Hand Quilting - no this isn't a crazy idea at all. 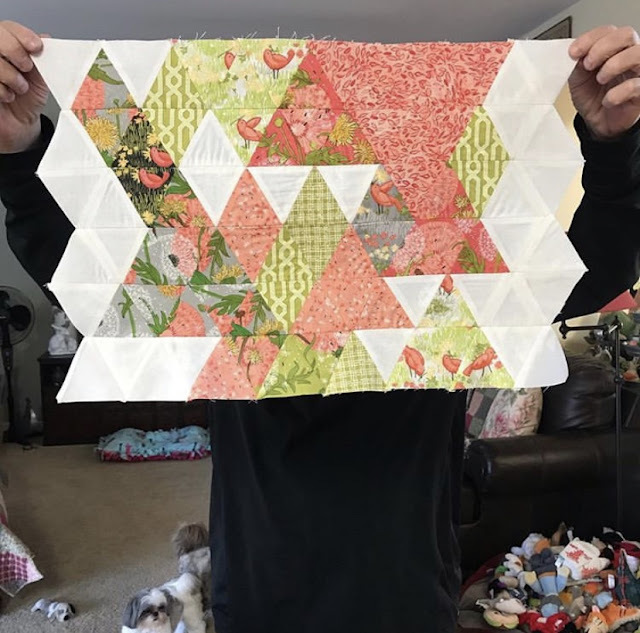 I love Hand Quilting and am even working on Hand Quilting a version I am making as a gift for an upcoming Baby arrival for a friend. I love the texture that Hand Quilting creates - it is so snuggly and soft and gives such an amazing texture to the quilt. 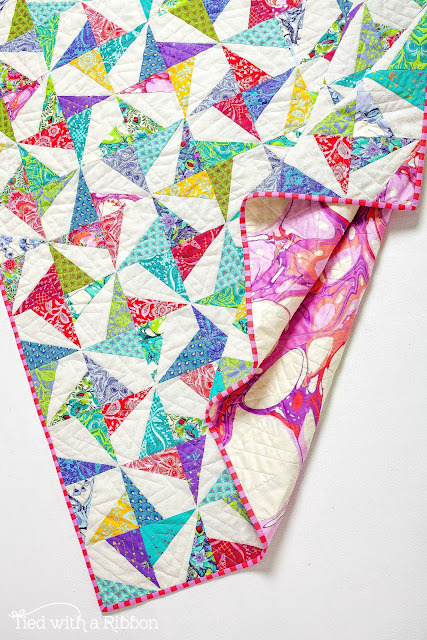 If you are keen to Hand Quilt your End Game Quilt then check out this Blog Post I wrote all about my favourite Hand Quilting Tips and Tools to use. 3. Send it to a Professional - there are lots of reasons to use a Long Arm Quilting service. 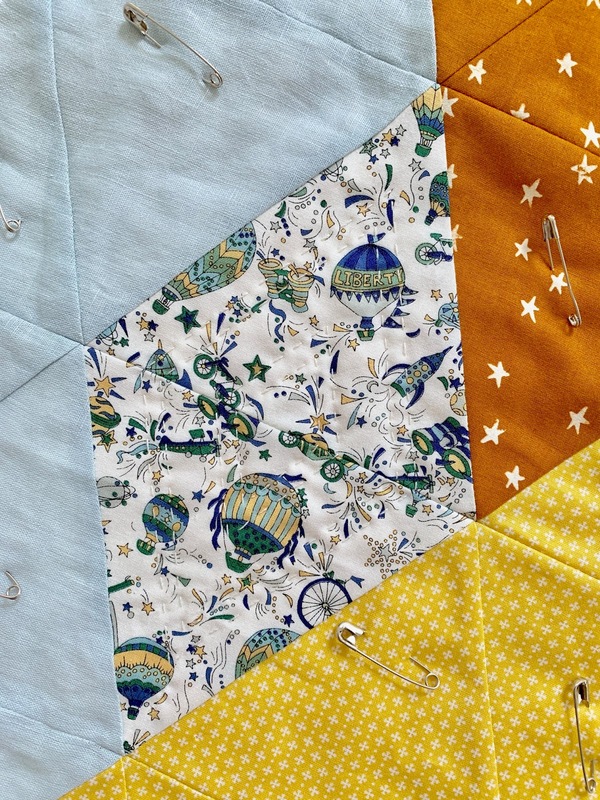 Find a Quilting service you are happy with and chat to them about your needs for this Quilt. 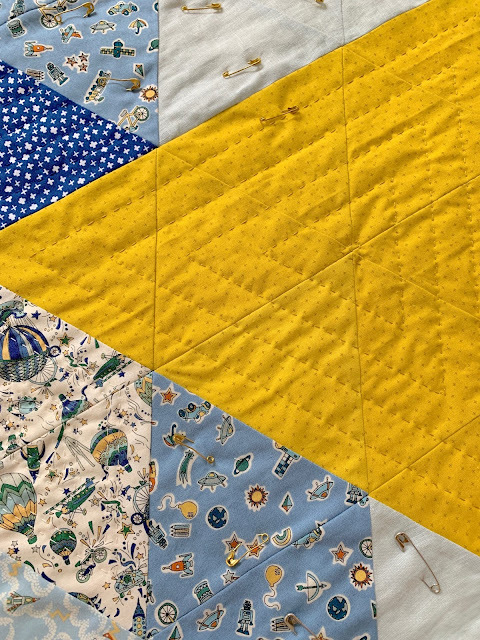 Always remember that when you send your Quilt to be Long Arm Quilted - your batting and backing fabric need to be at least 4in bigger on all sides than your Quilt top. 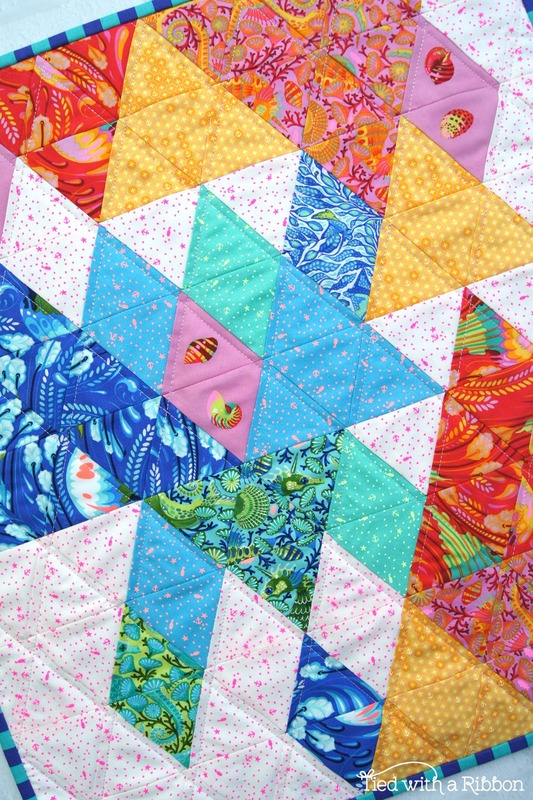 I had Carol Brady of the Quilting Cottage Custom Quilt my Original Tula Pink Solids End Game Quilt. 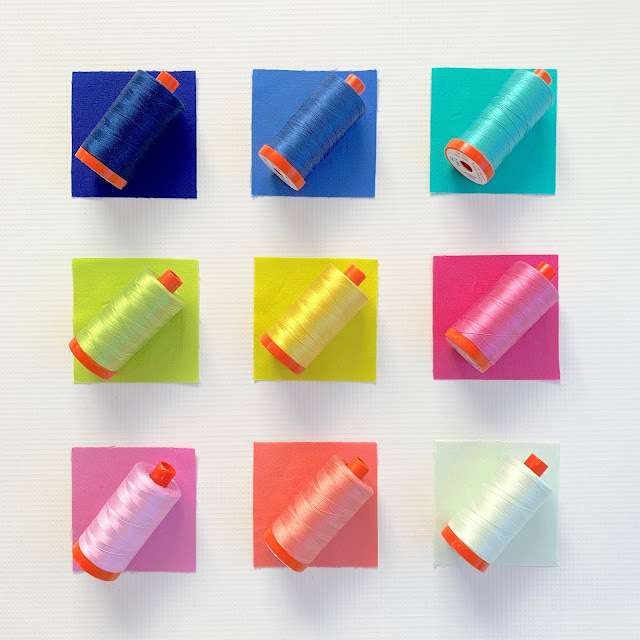 Custom Quilting is different to Edge to Edge Quilting so chat to your Quilter about what your budget is and what you want the quilting to look like. Here are some Pics of different Quilting that The Quilting Cottage has done on some different versions of End Game Quilts I have made. Once you have your Quilt all Quilted - now you can turn your attention to Binding your Quilt. 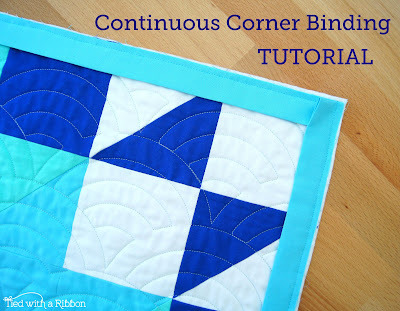 There are so many Tutorials for how to bind you Quilt if you Google. For our final week we have 2 amazing Sponsors with prizes up for the final week of the End Game Quilt Sew Along. Aurifil have one of my Quilt Big Thread Collections to give away as a Major Prize for ONE lucky winner. 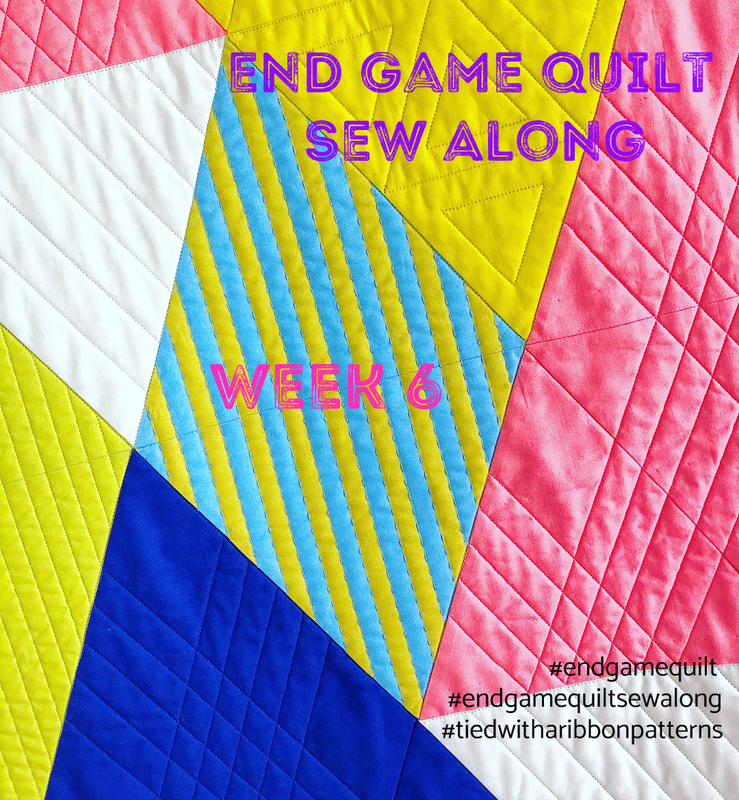 So to be in the running post your pics from the weeks prompt on Instagram to - #endgamequilt, #endgamequiltsewalong and #tiedwitharibbonpatterns. It also helps to tag me - @tiedwitharibbon to make sure I see your post. 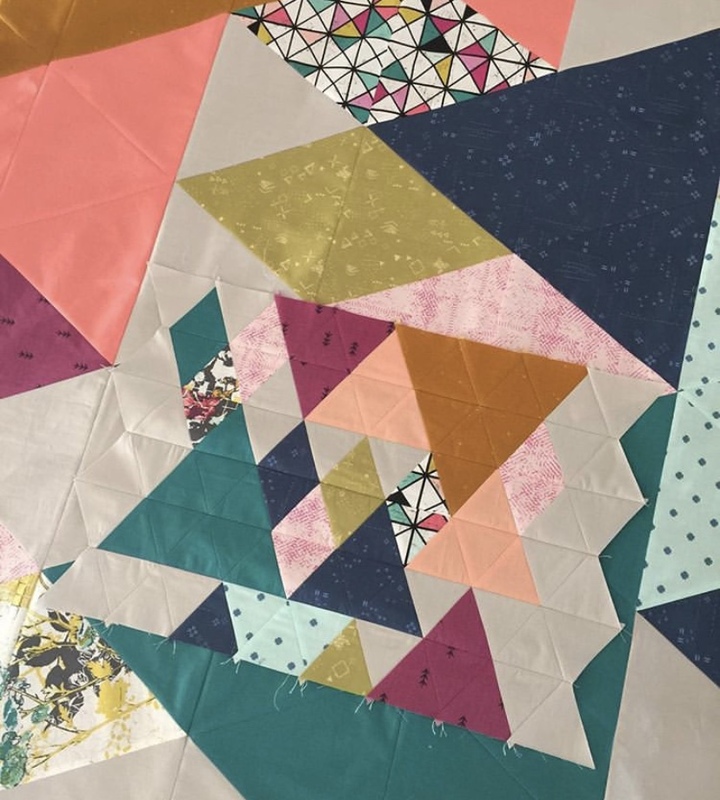 A massive thank you again to everyone who has bought my Pattern(s) and participated in the End Game Quilt Sew Along - I am so blown away by how many of you from all over the wold have joined in and just in love with your fabric choices and how your quilts have come together. 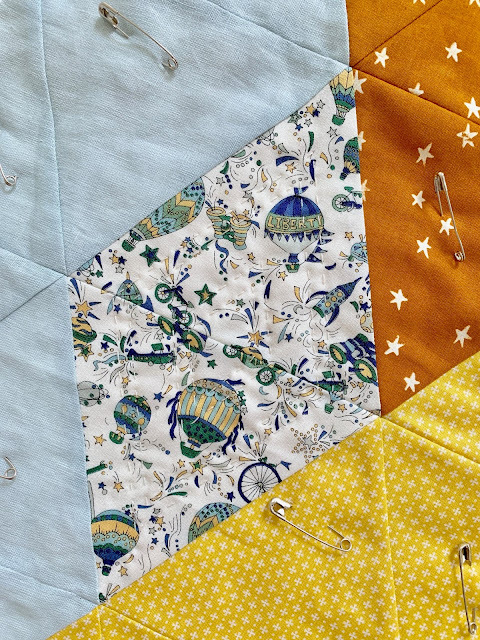 I can't believe we are getting so close to the end of the End Game Quilt Sew Along. 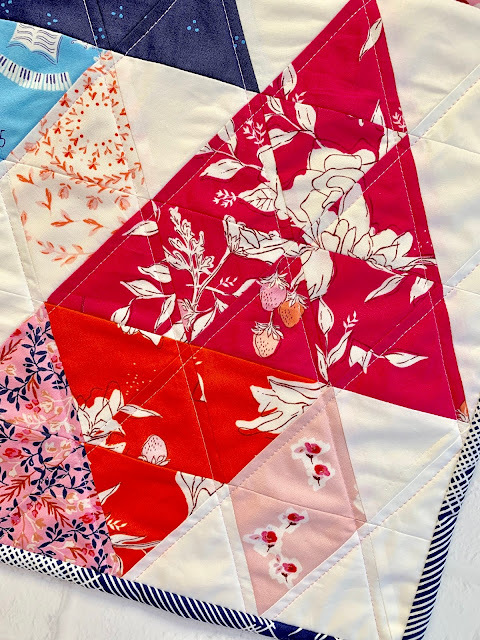 I have been so inspired by all the different and personal stories behind your choices for which fabrics you went with and how so many of these Quilts have an owner eagerly awaiting its finish. 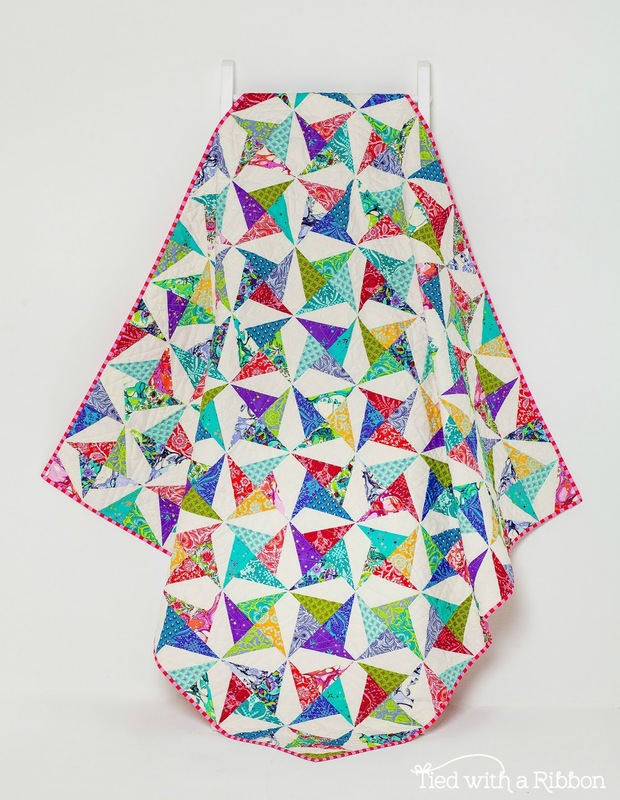 While Equilateral Triangles can be quite tricky when you first start, I hope that after the tips I have given you and a bit of practice you are well and truly feeling more confidant and seeing improvement and satisfaction at your points lining up. 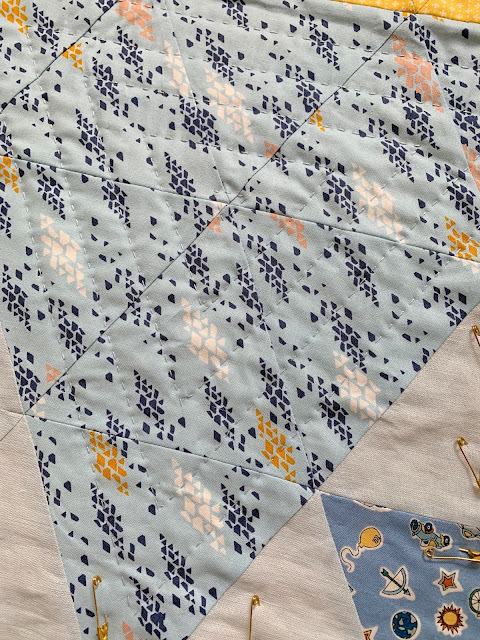 One of the things that I have seen lots of comment about on your posts is, just how quick this Quilt sews together - and that it seemed like this was much quicker than you expected to sew all the rows together. 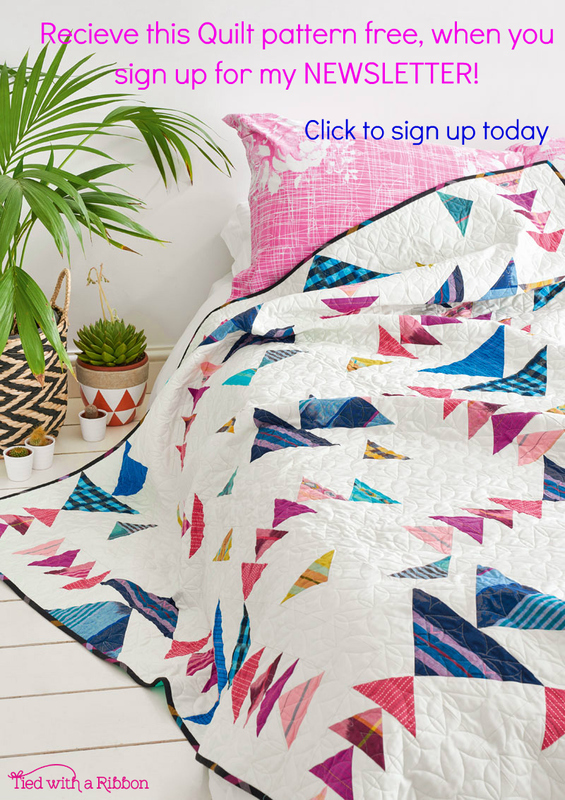 I am really excited to hear this and I know some of you are already even working on your second End Game Quilt. 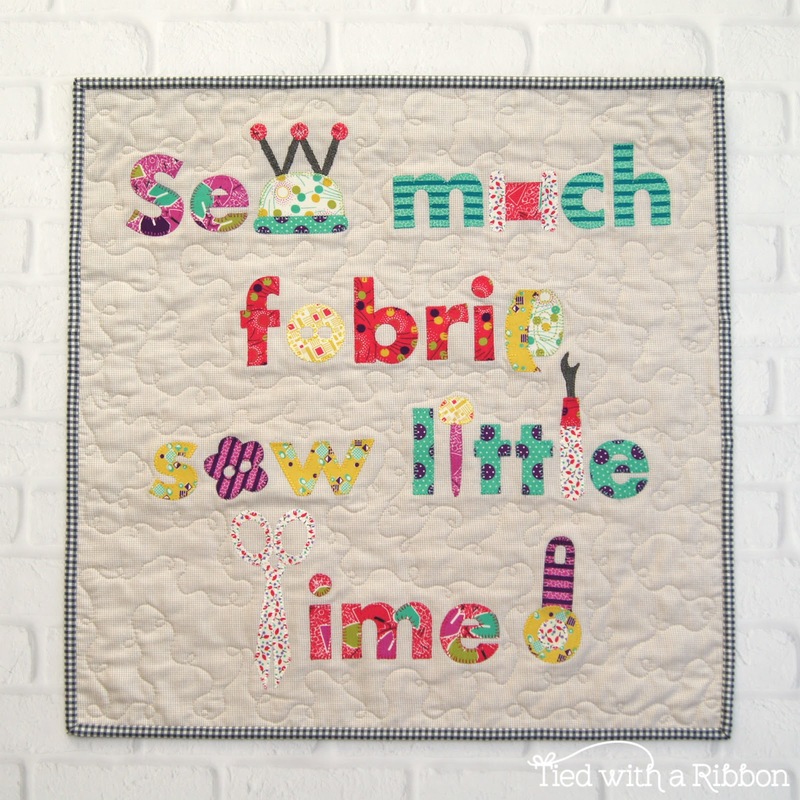 This week we are working on finishing up your last few rows - that is Rows 7-9 as well as sewing all the rows together (if you haven't done so already). 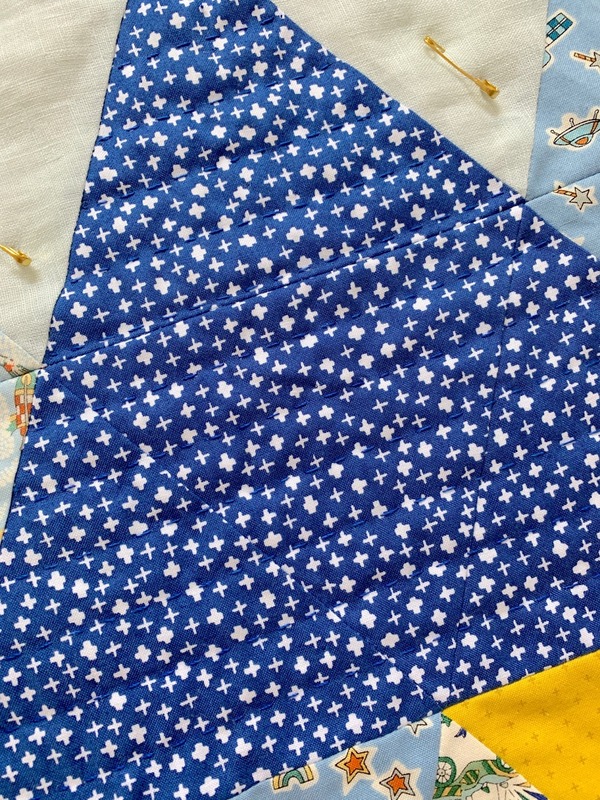 Our aim by the end of this week is to have a completed Quilt Top. This week we have some great prizes up for grabs from our Sponsors. 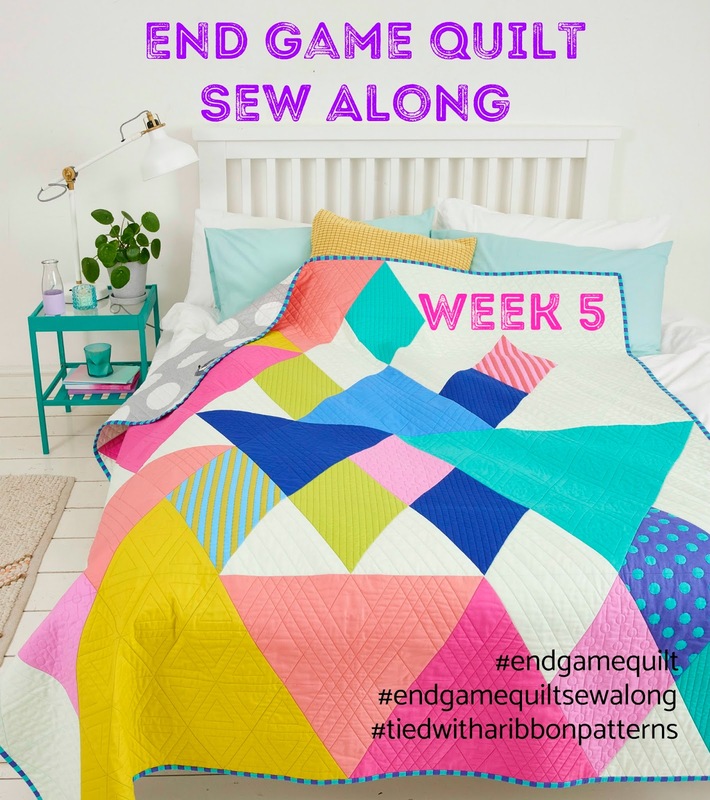 Next week will be the Final Blog Post for the End Game Quilt Sew Along - if there is anything you would like me to cover in this Blog Post send me an email to - tiedwitharibbon@gmail.com. 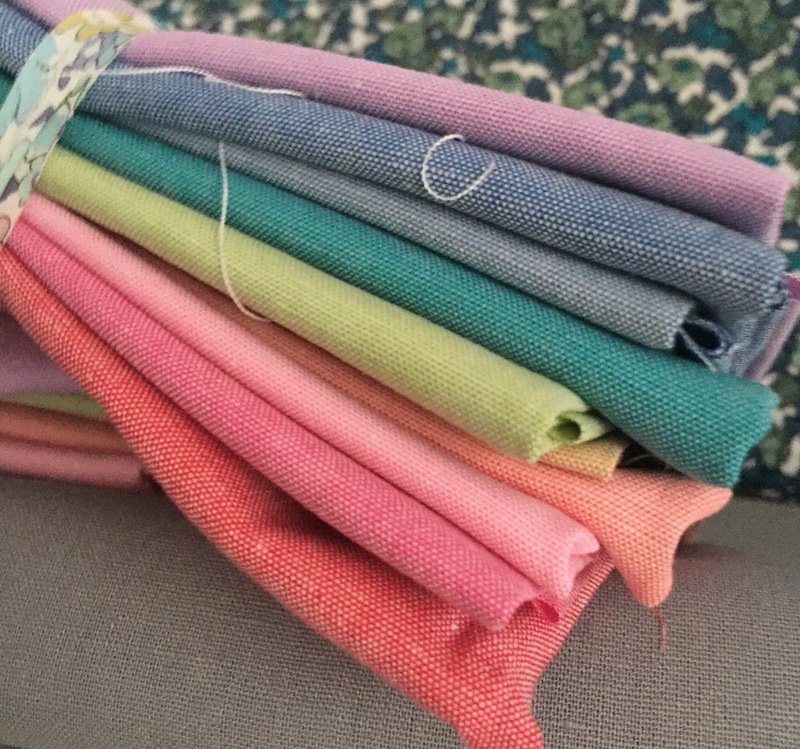 So far I will be covering Quilting options, Thread Colours that match the Tula Pink Solids fabrics and a Binding Tutorial to help out. If there is something else you would find helpful please let me know. 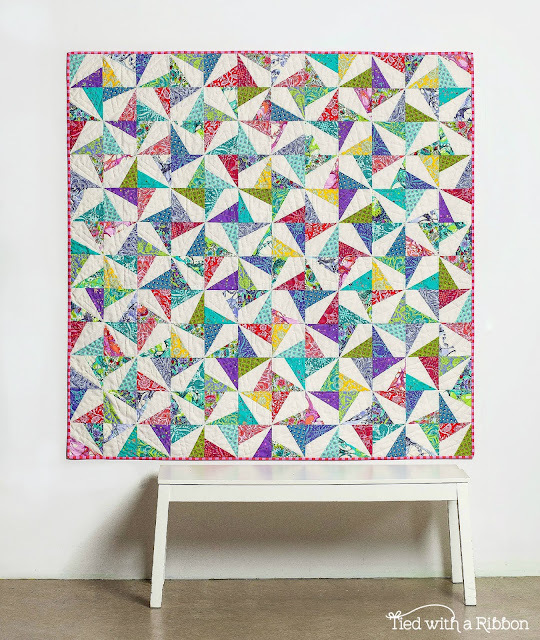 This is my Confetti Quilt and to say it is one of my most favourite pattern designs is an understatement. 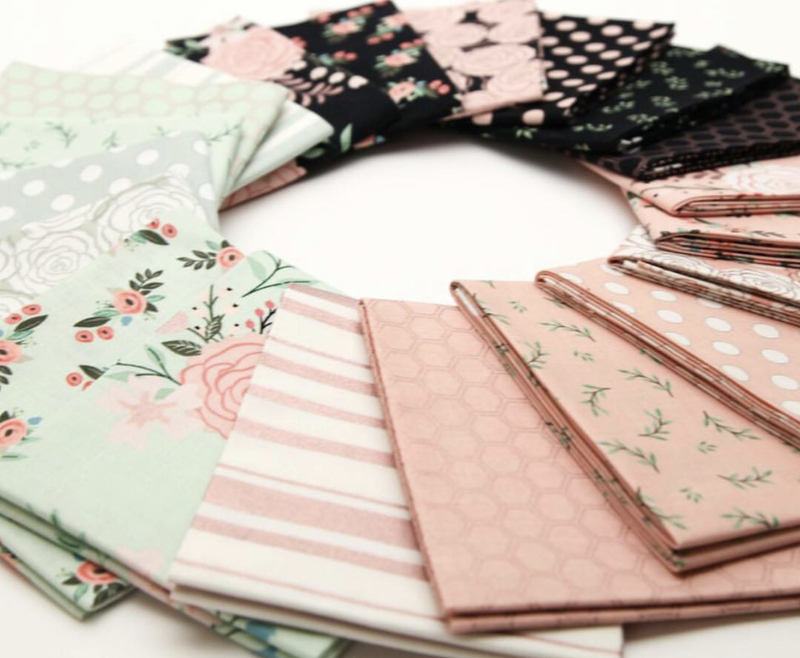 It has recently undergone a makeover for the Pattern with this absolutely stunning range - Pinkerville by Tula Pink. As soon as I saw this new collection I immediately knew I was going to HAVE to make a new Confetti Quilt with it. The Confetti Quilt pattern is so versatile as a design - and perfect for any person you choose to make this for. 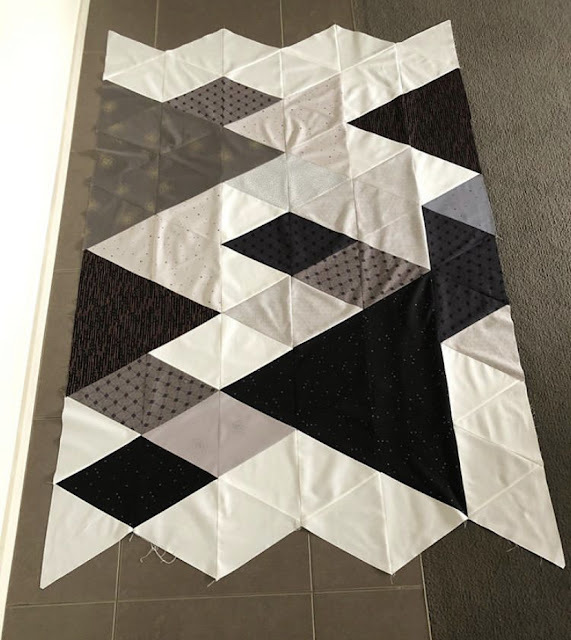 I have made a huge number of these quilts over the years for different occasions including my Brothers Wedding gift, a nephews birthday, one for my Dad's Birthday, my girls have a version each - one out of Alice Caroline Liberty and one out of Road Trip by Alison Glass. I have even made a few smaller version to celebrate new baby arrivals. As you can see this design suits everybody. I have made this version using Tula Pink - Pinkerville and Robert Kaufman Essex Linen Metallic in Opal for the background fabric. So if you are a Tula fan - you are going to love this range. 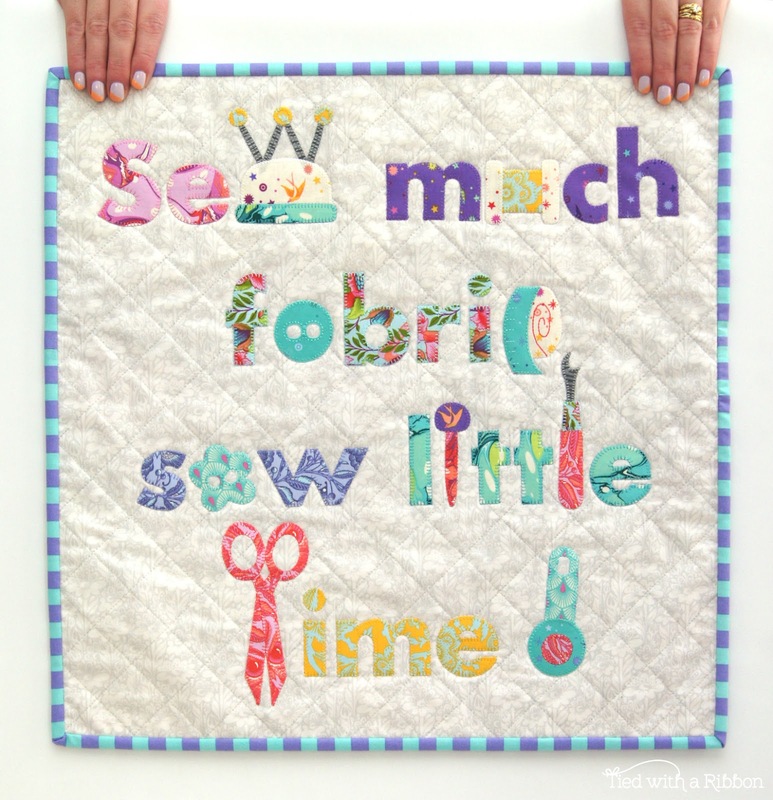 This pattern is simply machine pieced so it is suitable for even a beginner. Those more advanced with their sewing skills will breeze through making this fun and addictive quilt. You do not need to worry about points matching perfectly in this design. 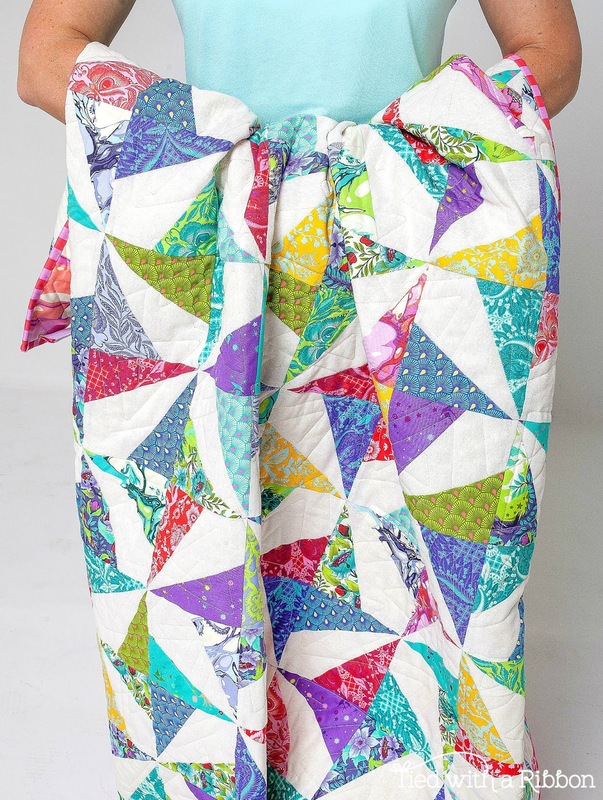 This pattern is Fat Quarter Friendly or also great to dive into your scrap bucket and make a dent. 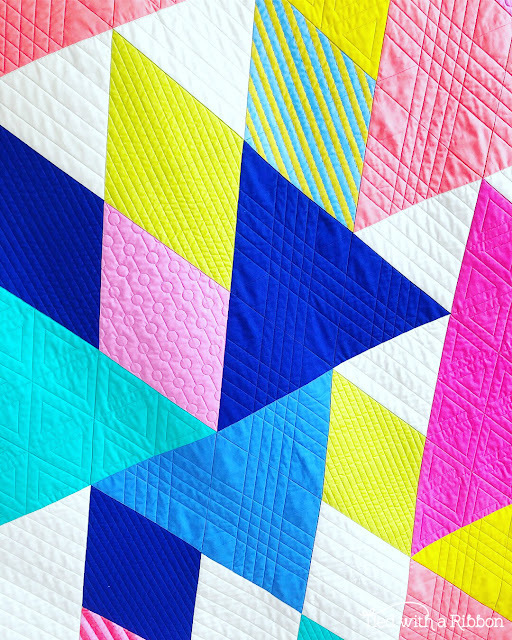 You will love making this Confetti Quilt. 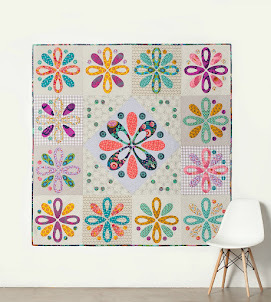 Also available wholesale through Creative Abundance and available in a large number of Local Quilt stores in paper format. 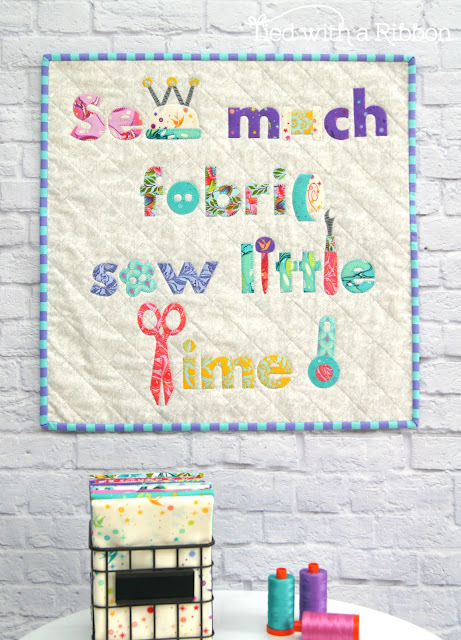 There has been such love for the Sewing Quote Mini Quilts that I have designed that I thought it time for a new design to add to the series. Introducing - Sew Much Fabric Mini Quilt (19.5in x 19.5in - 50cm x 50cm). 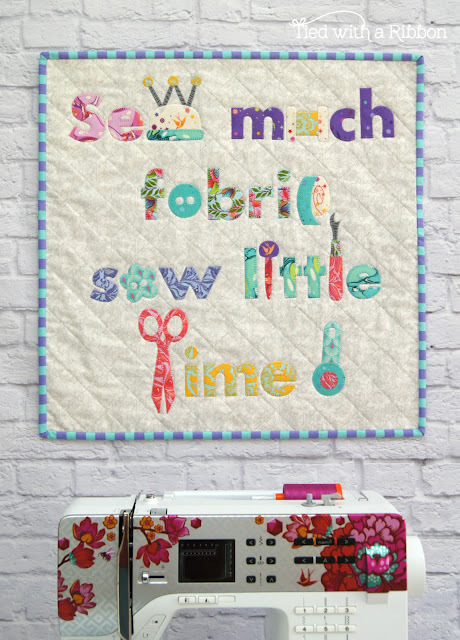 Isn't this quote the truth - as sewers and quilters we certainly have lots of beautiful fabrics so this was perfect to use as a design for a new Mini Quilt. Mini Quilts are fun to make and really quick. 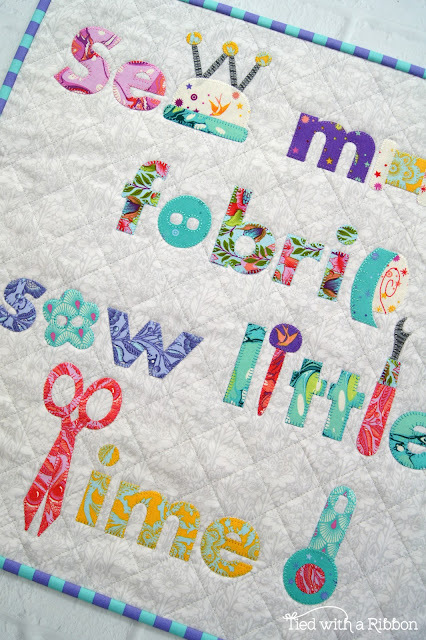 You can use special fabrics you have been hoarding or dive into your scrap bucket for all the lettering and notions in this design. 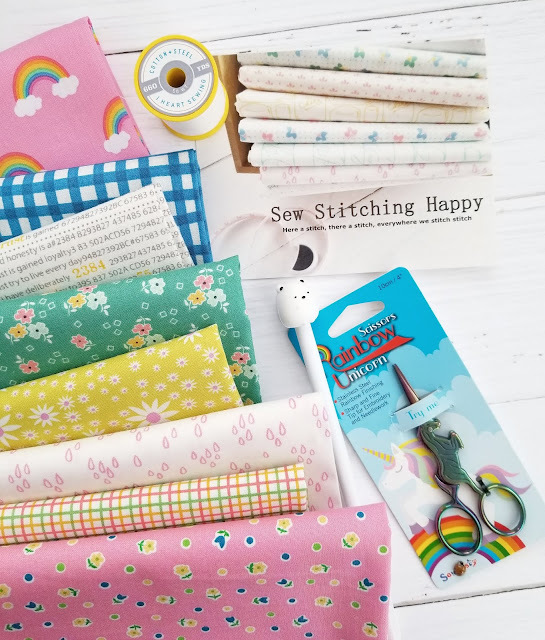 These make perfect presents to make for your sewing friends or for you to decorate your own sewing space with. 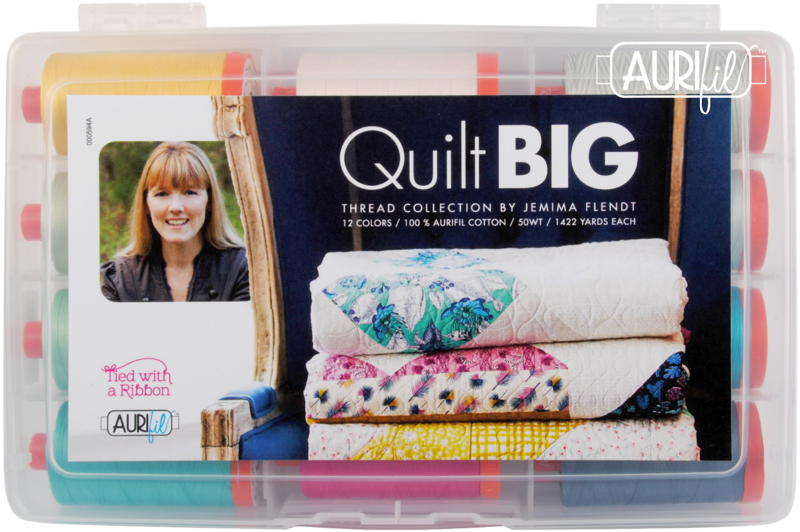 Also great if you are needing a Mini Quilt for a swap. 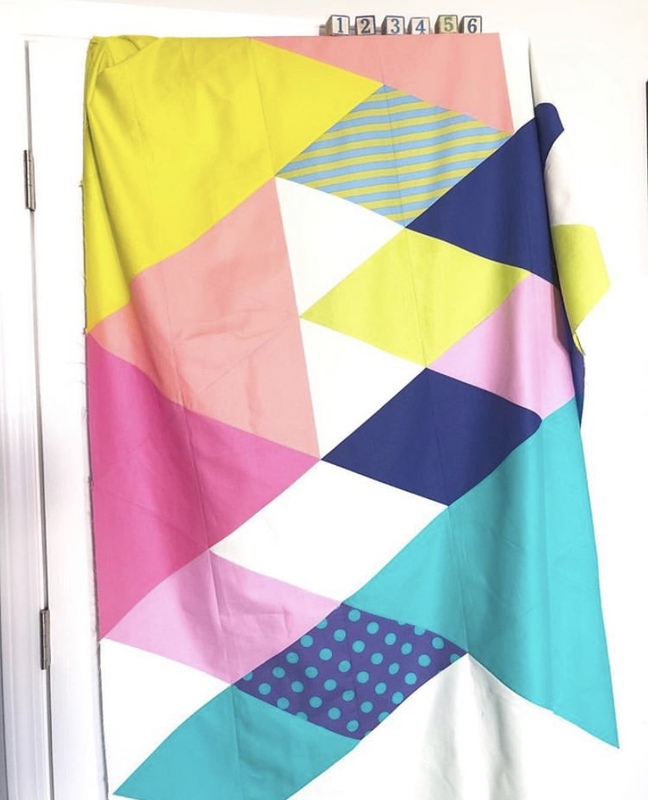 I made this version with Pinkerville by Tula Pink for Free Spirit Fabrics. You can Applique your lettering and notions any way you choose - by machine or hand. The pattern is also Scan and Cut friendly. This version has been made using Jen Kingwell's - Looking Froward range and her amazing wovens.